The combination of anchovies, olives and capers gives this sauce a robust flavor. 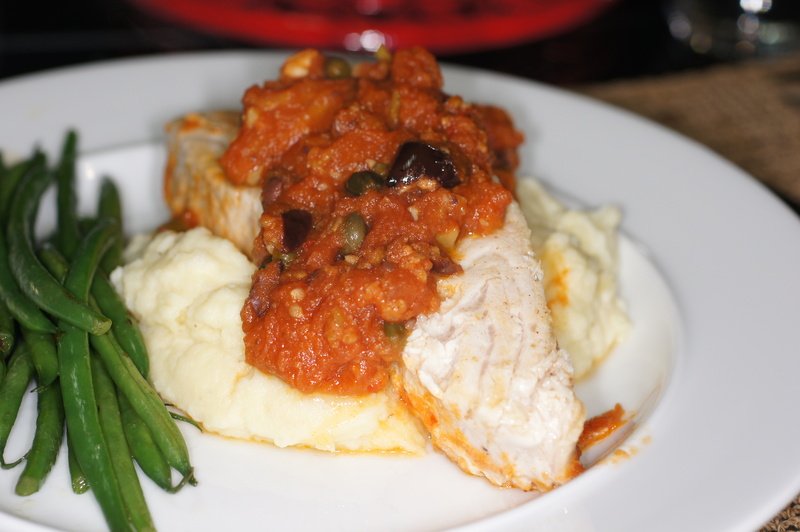 The swordfish being such a meaty fish is key to holding up to this strong, briny puttanesca sauce. You will like this, I guarantee! I have always wondered why they name dishes the way they do. Puttanesa sauce, politely called Lady of the Night sauce, has numerous stories as to its origination. One version is it is a sauce invented and made by prostitutes. According to this story pasta puttanesca was said to be designed to lure customers with its aroma. Another explanation was that the prostitutes were too busy to cook much, or that they had no storage for fresh ingredients and cooked entirely from the pantry. Another story is it was not originated by prostitutes, but by women who wanted to serve a quick meal at home in order to move on to other things. The latter 2 explanations of the sauce come from the fact that Puttanesca sauce comes together easily with a few pantry ingredients like anchovies, olives and capers. It is remarkably simple but to place its simplicity upon “lazy women” somehow rubs me wrong. My preferred story tells that puttanesca sauce was invented in the 1950s in Ischia by Sandro Petti, co-owner of the restaurant “Rancio Fellone.” According to this story, when asked by friends to cook for them one evening, Petti found he had little to cook. When he told his friends of his quandary, they responded by saying just make us a “puttanata qualsiasi,” meaning fix us whatever crap you have. He did and puttanesca sauce was born. Obviously, he couldn’t call it puttanata sauce now could he? Who knows where the name originated. All I know is this is a wonderful briny, robust sauce that combines with the meatiness of the swordfish to make an unforgettable dish. My only regret with dinner was that we served the swordfish atop fluffy mashed potatoes. While I love mashed potatoes, this dish really should be served with a fettucini, spaghetti, linguini or similar pasta because of its extra body. This is a wonderful dish well worth your time and effort to try. To make things even better, now you have a story to tell your friends about the origin of the dish when they come over and eat this fabulous meal. Heat oil in a 12″ heavy bottom skillet over high heat. Working in two batches, season swordfish with salt and pepper and slide into skillet moving away from you to avoid oil splatter. Cook the swordfish, flipping once, until brown outside and medium rare inside, roughly 3 minutes. Transfer the swordfish to a plate and set aside. Return skillet to medium heat. Add the garlic and anchovies. Sweat until soft, roughly 2 minutes. Now add tomatoes, olives, capers, and chile flakes to the pan. Cook until almost all the liquid evaporates, roughly 10 minutes. Return swordfish to skillet and add the parsley and lemon juice. Cook until the swordfish is cooked through, about 2 minutes. 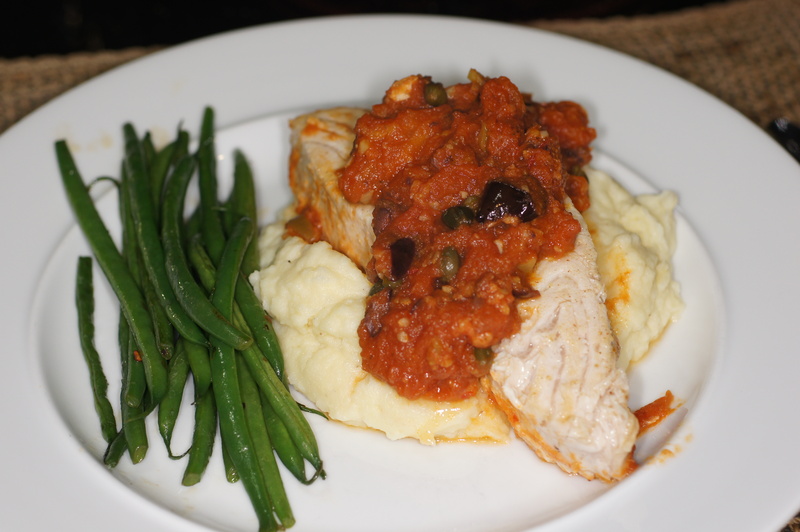 Divide swordfish among 6 serving plates and top with sauce. Enjoy! Hey. Are you becoming a dinner pimp?? Wait did I say that out loud??? Lovely dish as usual. I adore the way you can see the red sauce trailing through the swoordfish. Delish! I’ve been meaning to try puttanesca for a while now. This whole meal looks fabulous! Thanks so much for your very compliment. 🙂 We hope you try it and let us know what you think.